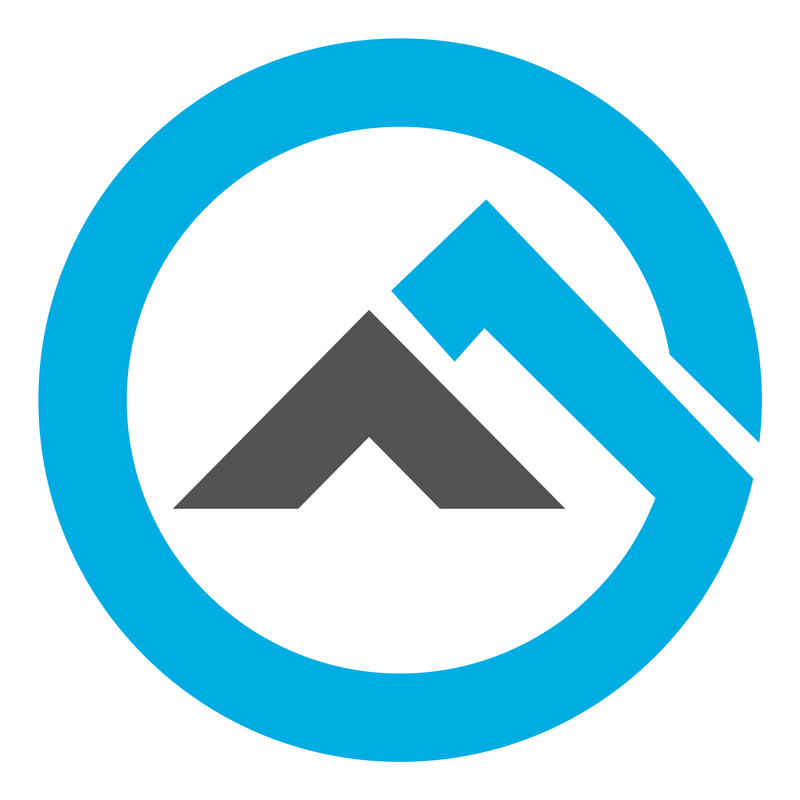 Andersen 3350 is the number one choice? Towing heavy loads with your truck is not a simple operation, one minor mistake and you could end up in a nasty accident. In order to ensure your safety, you have to make sure that the weight of the trailer and the truck is evenly distributed. The ideal tool for that task would be a weight distribution hitch with sway control but picking a suitable model could be tricky. Well, in the case you don’t know a lot about hitches and their characteristics, this article got something for you. 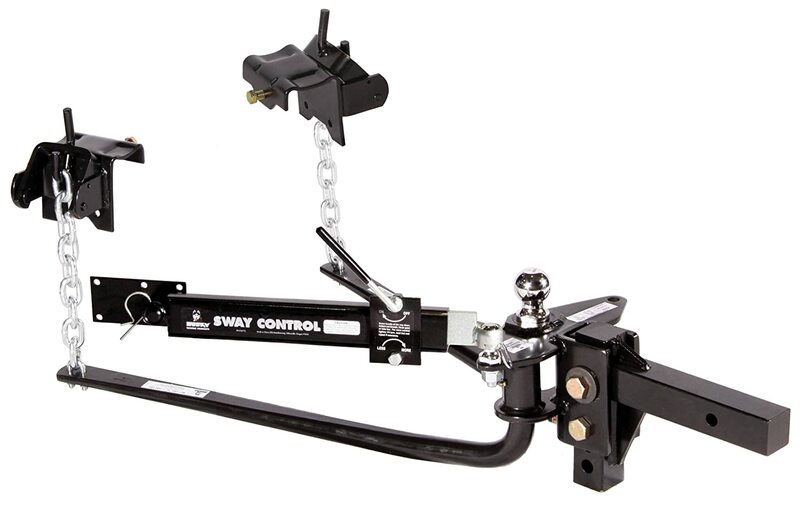 Down below is a list of excellent examples along with a comprehensive guide on how to obtain the best weight distribution hitch with sway control. Towing demand and individual habit vary greatly from one people to the other so you should expect conflicting opinions about a particular product. The perfect hitch to someone else could appear to be less than ideal in your eyes due to different towing condition and user taste. Therefore, you better take into account your own situation before making the final decision, only buy the product that matches your standard. To purchase a towing hitch when you only have a vague understanding of its operation and effectiveness is ill-advised. You could waste lots of money in the process for negligible gain so think carefully in order to come up with a wise investment. Always remember to incorporate your personal need and requirement into the selection process instead of making the decision base on other recommendations alone. An ideal choice for most towing operation, Andersen 3350 is one of the best weight distribution hitches with sway control around. You should have a hard time finding another product which could match the versatility and durability of the Andersen product. Instead of classic spring bars or dual cam, the hitch employs flexible chains which should automatically deal with any swaying. Because the hitch is not vehicle specific, the installation process is a breeze, you could adapt it to your truck in no time. All it takes is 30 minute and the Andersen hitch would be ready to go. Its tongue weight and gross are sufficient to handle the average towing loads without fail. One innovative feature of the Andersen 3350 hitch is its efficient anti-bounce urethane springs, they are very good at absorbing trailer bounce. Thanks to the use of advanced material and motion dampening body, you could barely notice the hitch presence due to its smooth operation. 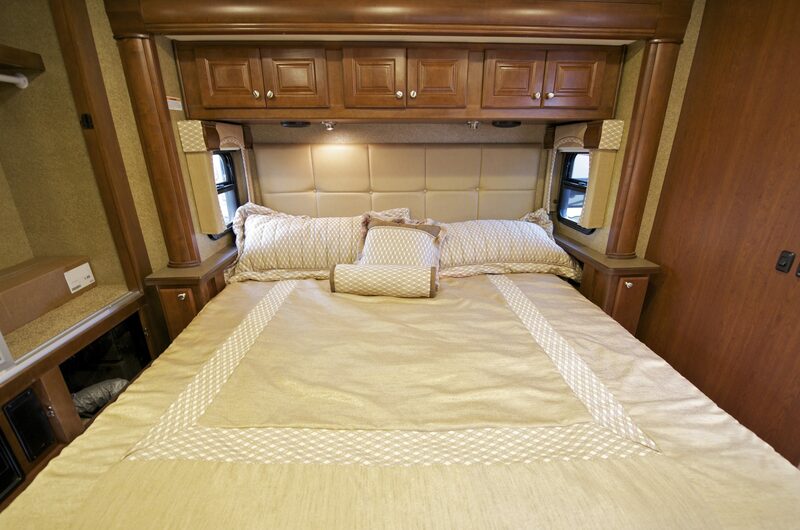 While the Andersen 3350 possesses a competitive performance, it also has an expensive price tag. But if you want to own the best weight distribution hitch with sway control and have money to spare, the Andersen could be a good choice. Compared to traditional weight distribution hitches with solid steel spring bars and weight up to 100 pounds, Andersen 3350 is a lot lighter. At only around 50 pounds, the Andersen hitch is quite easy to handle and install, especially when you are alone. Should you have no need for the weight distributing ability of the hitch, Andersen 3350 could function as an ordinary ball mount. The pin removal feature permits straightforward relocation at moment notice. The coupler and the ball move as one without any requirement for grease. With a small number of parts and tough machine tapered spring bars, Eaz-Lift 48053 is designed to offer you a smooth ride. The bars are completely interchangeable so the Eaz-Lift product has positive latching action. That feature is a major plus for a weight distribution hitch. Because the bars are made of chrome – molybdenum, they are able to last for quite some time with a minimal amount of maintenance. The purchase includes everything you need to assemble the system like pin, ball mount, spring bar, bolt package, brackets, hook up brackets, etc. Each Eaz-Lift 48053 must go through a sophisticated manufacturing procedure in order to ensure consistent performance and customer satisfaction. The process involves accurate drilling, forged roll bending and thorough heat treating, these make the Eaz-Lift hitch a joy to work with. Another proof of the hitch excellent characteristics would be its 5-year warranty which clearly shows the manufacturer confidence in their product performance. Because of its qualities, Eaz-Lift 48053 earns its well-deserved reputation as one of the best weight distribution hitches with sway control. While the ratings of the Eaz-Lift 48053 are not very impressive, its lightweight body let you handle the hitch conveniently and effortlessly. Besides its usual function as a weight distribution hitch, the Eaz-Lift product could also be used as a weight carrying hitch too. However, without using the spring bars, the Eaz-Lift 48053 weight ratings shall drop to around more than half of the original capacity. When you employ the Eaz-Lift product as a weight carrying hitch, it only has 600-pound tongue weight and 600-pound gross weight. By utilizing a highly effective friction sway control, Pro Series 49903 is a good hitch to use when you are experiencing excessive swaying. Whether it’s side wind, passing vehicle or other factors, the hitch should let you have a firm control of the trailer movement. The hitch powder coated solid steel shank is flexible and you could adjust its height to better suit your current situation. It’s a rather heavy hitch to handle on your own so you should consider asking for assistance if needed. The included manual is very detailed and quite simple to understand, you could finish installing the hitch after a short amount of time. Pro Series 49903 also possesses forged steel spring bars that are manufactured with flexibility in mind, the bars tension is adjustable as well. To match the requirement of individual trailer type, the tilt of the head could be modified using washer and rivet. The sturdy body and reliable operation of the hitch make it a wise investment. In term of all-around performance, it’s among the best weight distribution hitches with sway control money can buy. Its reasonable price means most people could afford Pro Series 49903 without any problem. For the usual hauling job, Eaz-Lift 48058 weight rating is often sufficient to meet your towing needs and requirement. The numerous holes on the hitch make it some of the best weight distribution hitches with sway control in term of vertical adjustment. With up to 6 inches of height settings, you should have little trouble adapting the hitch to the configure of your trailer and truck. Due to the fact that the hitch components are pre-assembled, you could get the hitch up and running in a blink of an eye. All you need to do is to drill a hole and everything else should fall in without fail. The hitch also has a quiet operation which means you don’t have to worry about additional noise. Eaz-Lift 48058 employs heavy-duty steel for its bars, this guarantees a dependable and long-lasting performance. 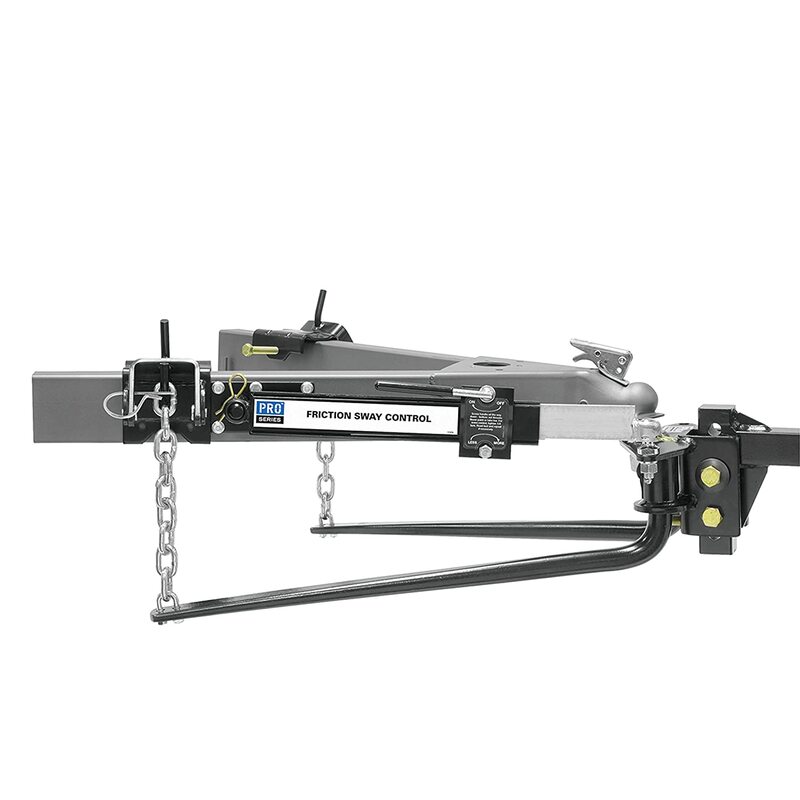 Though the weight ratings are not exceptionally high, the Eaz-Lift hitch is capable of handling the average towing demands. Its super simple installation process is well liked by people in need of a robust anti-sway weight distribution hitch. While it’s unable to support heavy hauling, Eaz-Lift 48058 would be a nice choice for universal applications. Its price tag is considered to be reasonable given the hitch top notch quality. Using the advanced 4 point sway control, the Equal-i-zer 90001000 hitch would deliver you an uneventful towing experience. 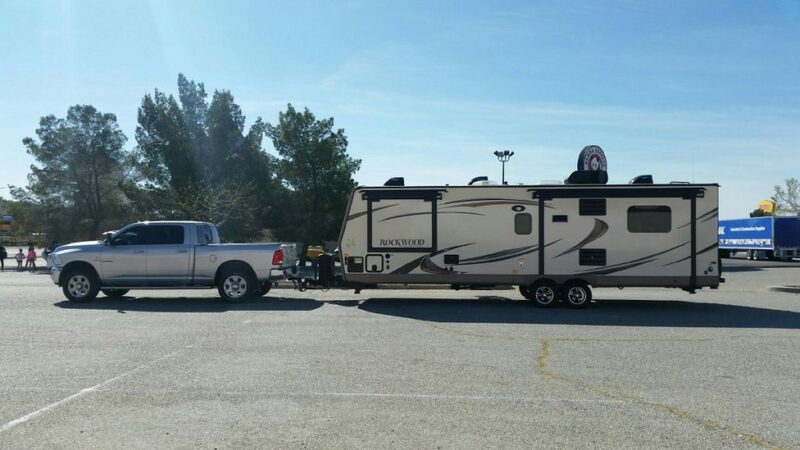 The hitch could work on any kind of trailer configurations and towing vehicles so it’s a good choice for everyone. Its installation is a bit complicated though since there isn’t a lot of space between the bars socket, professional assistance might be needed. The rest is pretty straightforward, the hitch works in a rather quiet manner though things could get noisy when you make sharp turns. Its height could be adjusted by manipulating the bolt which is not as fast as other pins used hitches but still adequate nonetheless. Equal-i-zer 90001000 is very easy to operate, you could engage and disengage the hitch from a variety of angle without fail. The use of quality steel for the hitch components provides excellent structural integrity and reliable operation for the hitch. Because the hitch is backed by a lifetime warranty, getting it would be a cost-effective purchase in the long term. Though it’s rather pricey, cumbersome and a bit noisy from time to time, Equal-i-zer 90001000 is still a quality hitch well appreciated by many people. Come with a reasonable price tag, Husky 30849 is not a bad choice to consider if you are shopping on a limited budget. Its black polyester finish is capable of resisting rust and corrosion effectively for quite some time. 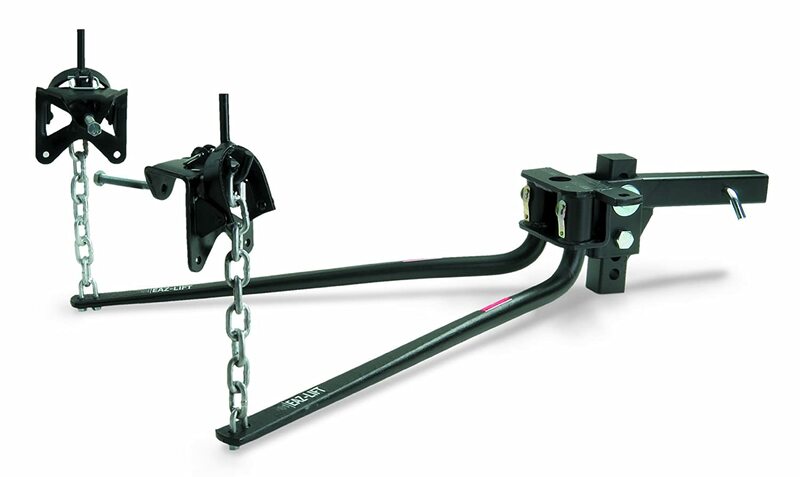 The hitch lift bracket permits an easy and effortless hitch hook-up which mean everyone could operate it. Since the spring bars are interchangeable, each bat would conveniently fit the left and right side of the hitch head. 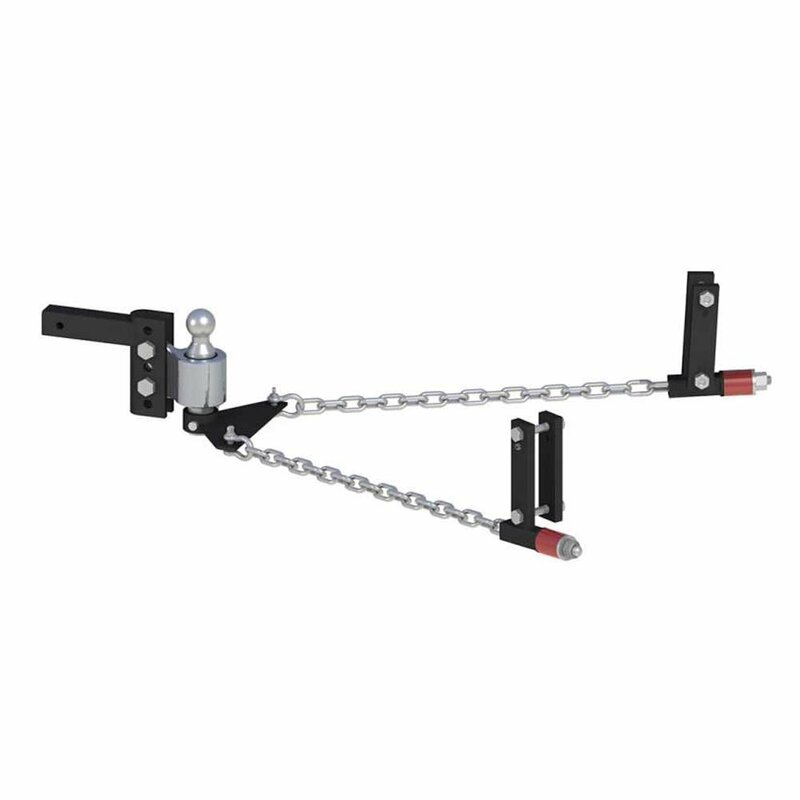 The hitch purchase should also provide you with chain and assembly hardware as well. 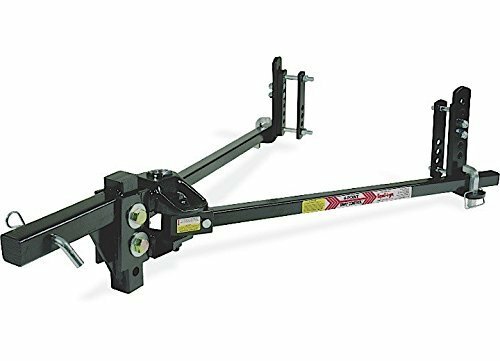 Husky 30849 offer you up to 8 inches of height adjustment so you would have an easy time adapting the hitch to your situation. The hitch 1,200-pound tongue weight and 12,000-pound gross weight rating make it a match for the standard towing operation. Its friction sway control consists of a dual brake pad system to minimize sway from side wind and passing vehicle. If you intend to tow a trailer that is over 16 feet in length, Husky 30849 would be a quality and affordable hitch to use. 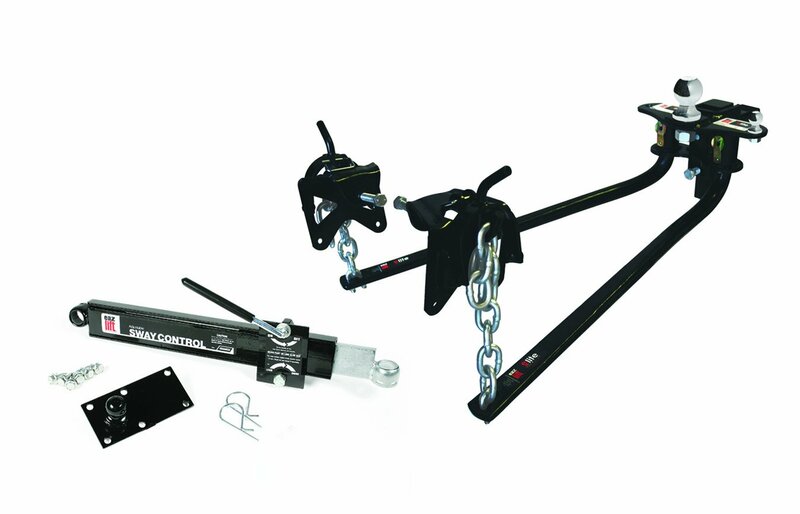 The hitch weight rating permits it to become one of the best weight distribution hitch with sway control options in the price range. Featuring an all steel body, Reese 49902 is a tough and sturdy hitch that could last for years to come. Due to the presence of solid steel components, the hitch is quite heavy compared to the average weight distribution hitch. The spring bars are also made from solid steel though they remain really flexible and simple to install. A durable steel chain connects the bars and the brackets, you could lower the brackets using a pry bar to hook the chain. Overall installation is very simple and you would receive a detailed manual on the subject when you make the purchase. The sway control and the hitch ball of Reese 49902 are already preinstalled so you don’t have to do that on your own. It has everything you could expect from a weight distributing hitch at an economical price though the weight ratings are not very high. Nonetheless, it’s still a simple to hitch to operate, you could conveniently adjust the height by manipulating a thick heavy duty bolt. The head pivoting is adjustable through a rivet with washers as well. In general, it’s a good hitch to use in light towing operations. There are different weight distribution hitches for different trailer specifications, you cannot simply use what you like without proper consideration. To choose the right hitch for your trailer, you must know the trailer gross weight, check out the owner manual for the number. In the case you are unable to ascertain the gross weight of the trailer on your own, you could contact the trailer manufacturer. That should provide you with a reliable answer and help to narrow down the number of weight distribution hitch you have to check. 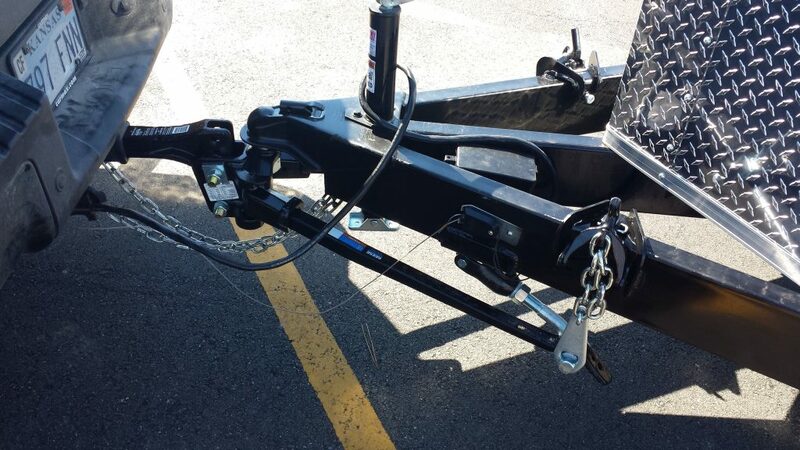 Trailer gross weight is one of the main things you should pay attention before purchasing weight distribution hitch! The average time it takes to get the hitch up and running is around one hour, depending on the layout of your truck. Some of the best weight distribution hitches with sway control only require around half an hour but their acquisition cost isn’t exactly cheap. In general, with a bit of skill and appropriate tools, you would have no trouble setting up a modern-day weight distribution hitch. Invest your effort into the installation process and you should complete it in a blink of an eye. 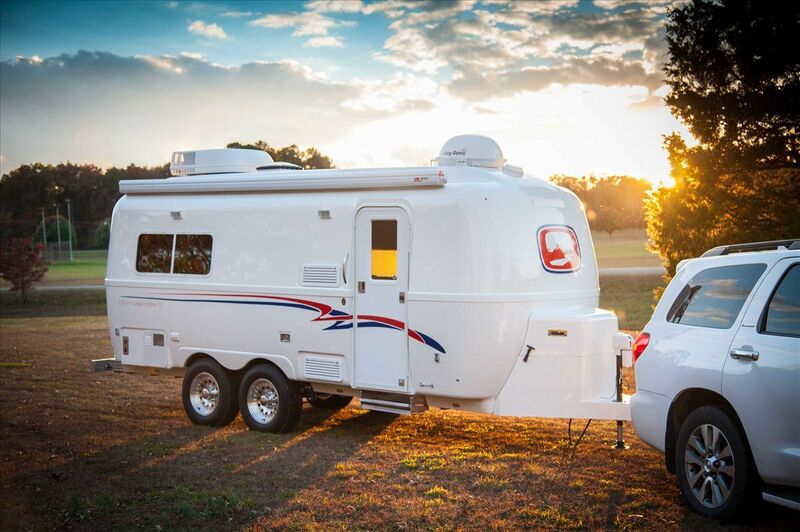 Nonetheless, if you intend to install the hitch by yourself, it’s advised to stay away from sophisticated hitches with complex installation steps. The finish of the hitch affects its appearance and overall endurance so you have to take a good look at the hitch surface. Many finishes are available such as black-powder coat, carbide black-powder coat, A-coat pre-finish combine with the black-powder coat, etc. The tougher the finish, the higher the hitch price, some RVer and truck owners even require specific finish base on their personal taste. Therefore, you could say that the hitch finish has a considerable influence on the hitch performance and its acquisition cost. There are two popular types of spring bars design a weight distribution hitch could employ: Trunnion bars and rounded bars. Trunnion bars are capable of giving high weight ratings which make the design compatible with sizable trailers and heavy loads. On the other hand, rounded bars are usually more forgiving when it comes to height clearance and setup procedure. If needed, you may attempt to consult other people and professionals about what kind of design you should go after. Though the hitch has its drawbacks, Andersen 3350 nonetheless deserves the first place in the list due to its helpful features and excellent specifications. It could be used on a multitude of vehicle and trailer plus the hitch is really quiet in operation. There should be no disturbing noise when you make sharp turns or back up the trailer as it often the case with other hitches. Its lightweight body let you move it around and install the hitch without too much difficulty. Though the hitch price tag is high, its quality performance more than makes up for that. 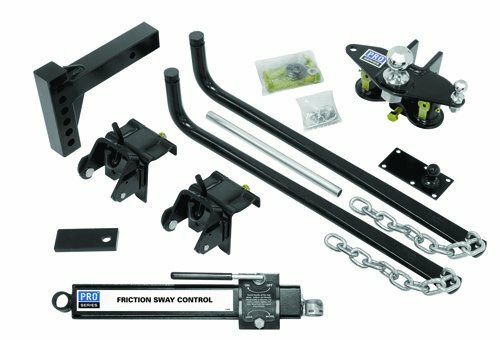 You get what you pay for so if you want the best weight distribution hitch with sway control, you better take a look at Andersen 3350. Buying the hitch would be a decision that you would not regret. While Pro Series 49903 has no impressive characteristics, it’s the hitch that could be put to good use by most people. 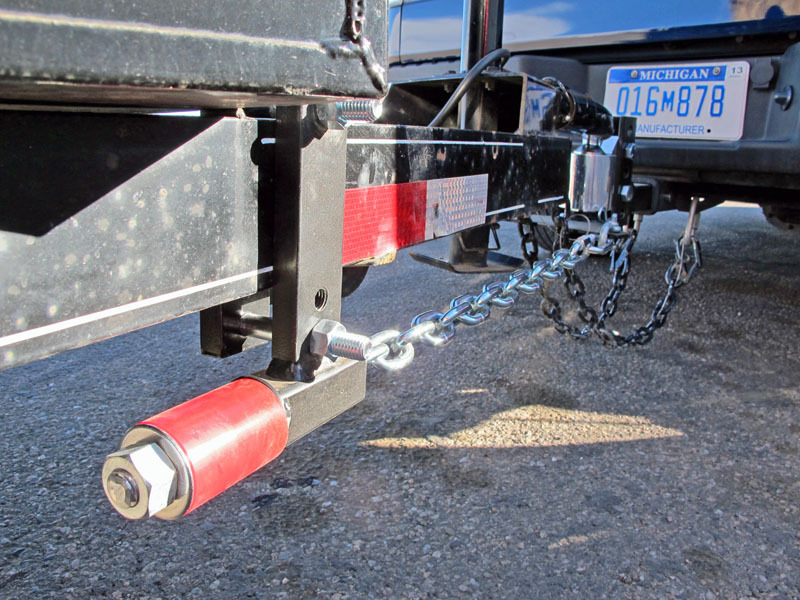 The hitch could handle the average towing operation without any notable issues.